The two words most people use to describe the 16th President of the United States are “Abraham” and “Lincoln.” Why? Well, for one, that’s his name. But there’s also an understanding that Americans have about “Abraham Lincoln.” It stands for a man who spent nearly five years in Washington, D.C. and actually got something done! Of all the names that have been preceded by the word “President” his stands above the rest as a paragon of courage and determination in the face of quite overwhelming odds. By all accounts, Lincoln was a pretty cool guy and a keen President. Or was he? 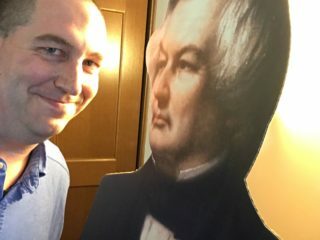 An Appleton historian, H. Ryland Stevenson, has turned the world of history upside down with his new book Lincoln: Is That the Best He Could Do? (Unpredictable Living Quarters Press, $33.72 ppd) Stevenson’s main idea here is that Lincoln’s long run of success in office was based entirely on luck and not on ability. For example, long-lost diaries of close aides appear to show that Lincoln and his Cabinet would make important war decisions not based on field data gathered by Union generals or by sound strategy but by asking questions to a Magic Eight Ball toy and taking its advice. Historians around the world have used words like “shocking,” “inhuman,” and “dangerous” to describe Stevenson’s latest work of history. But he’s used to it by now. In 1993, he was unceremoniously dumped from the ranks of the American Historical Association for his book Not Quite Holy, where he proposed that Moses actually ghost-wrote the Ten Commandments for God since we have no sample of God’s handwriting that would prove that the Commandments were his. He got in trouble again in 1995 for The Satanic Limericks, his fictional sequel to Salman Rushdie’s infamous Satanic Verses. In fact, Lincoln: Is That the Best He Could Do was written while Stevenson was recovering from a concussion he received last year while being pelted with fruit during a job interview at Appleton State University. There is one question, though, that begs to be asked: if H. Ryland Stevenson doesn’t think that Abraham Lincoln is a worthy example of historical statesmanship, then who the heck does he like? The answer may be found in his next project: at present, Stevenson is writing a biography of Davy Crockett star Fess Parker and his apparent ties to policymakers around the world in his heyday. It makes you wonder if Fess used a Magic Eight Ball when he made decisions.